A mad scientist (literally!, but only when he's upset, which is rare...) den leader, me (CC), and two energetic cubmasters are working on holding our own inaugural cubmobile derby this spring - only open to dens from our two sister packs this year. 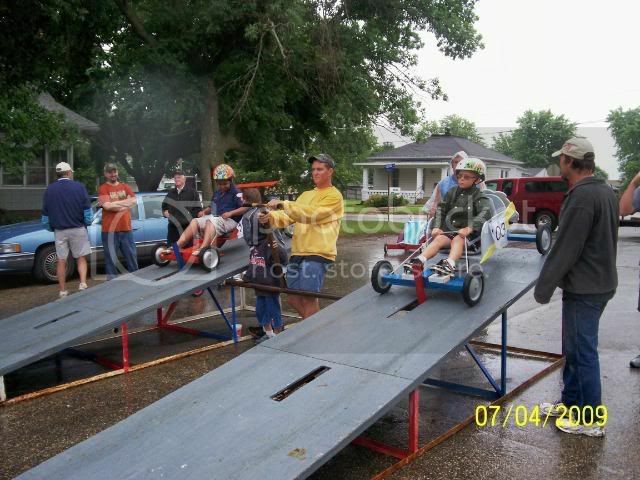 I've not seen any links to plans or examples of starting ramps - are there any out there? I'll likely modify anything I find, or will design our own if need be. One change I'll make based on the pictures I've seen is to add a smooth transition bend where the ramp meets the pavement - should help w/ stability and minimize chassis shock loads on the transition to the flat. 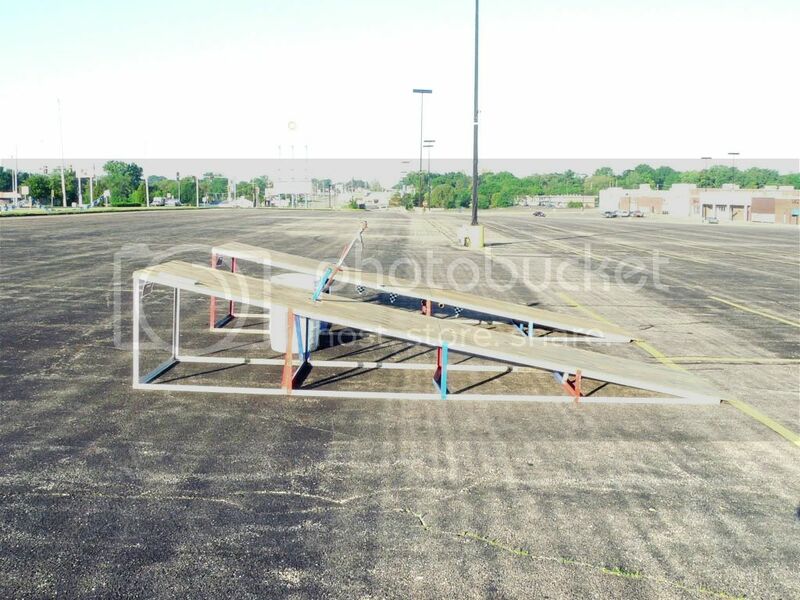 Anyone built a start ramp have any tips or lessons learned you could share? Have not built one myself...Sporty will likely chime in here soon. A few things come to mind though, you may have already considered. 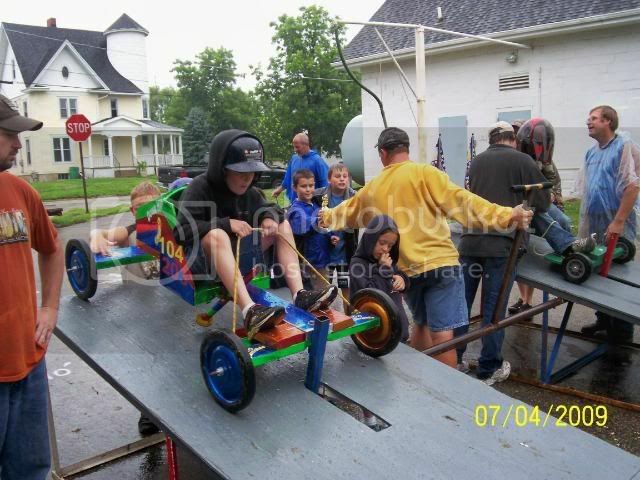 Build it sturdy, cubmobiles plus drivers, can add up to some weight. 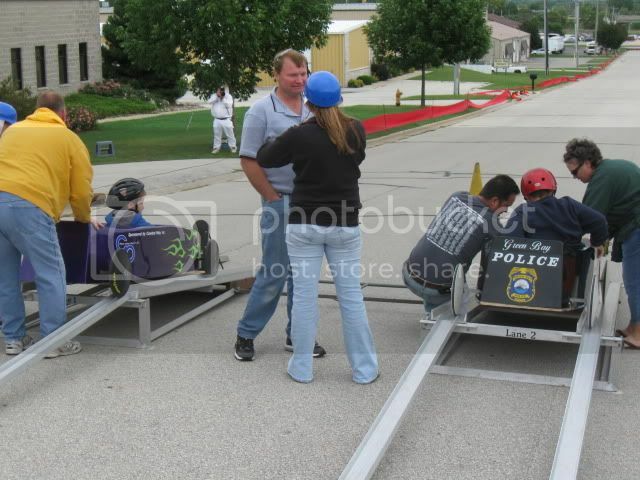 Walking, climbing into cars will make for some 'shimmy' side to side bracing is needed. Build the starting 'gate' or holder very sturdy, but use a latch mechanism that doesn't have to 'unspring' the weight being held against it. Know what I mean? Say your gate flips up and holds two emtpy cars. And you can then pull a lever and it falls gracefully. 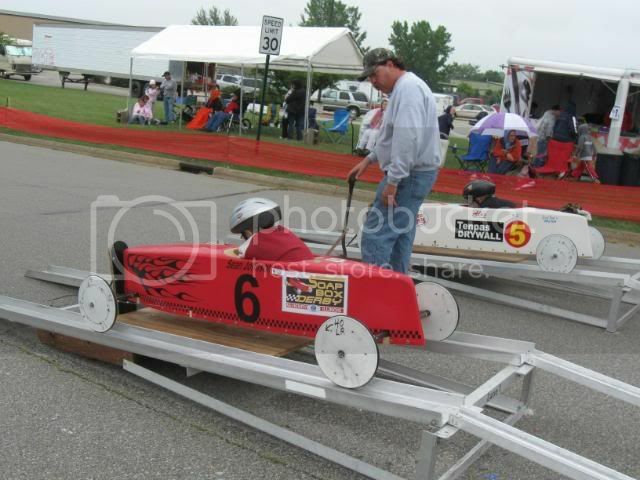 Now ask yourself, if I add the weight of two drivers, can I still pull the start lever with the same force, or must I pull alot harder becuase that extra weight is pushing more on the latch? If well made, it should not matter how much weight is/isn't on the latch. Build it portable. Contray to point one, but somebody gotta store this beast until next time. Same for truck transport. Handrails. Are scouts going to walk up the ramp to get in? Any open holes they can fall into? Can they slip and fall off the sides or back? Will adults be pushing cars back up to stage them? 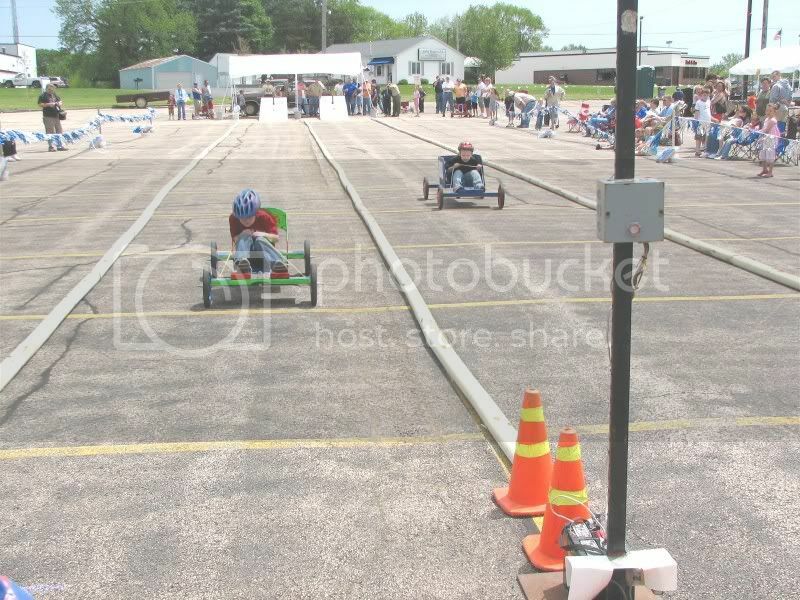 Search flickr, webshots, youtube, etc - cubmobile AND soap box derby. While often made of metal and just ramps for the wheels - most all SBD tracks in the flat South, use a ramp start of some kind. Lastly, it does have to be super angled. While the overall speed will be less, as you have already mentioned, transtion onto the flat is a good place to actually loose speed, loose control, etc. So raise the back maybe only 10-15 degrees....? No need in my mind for 30+ degrees of incline. 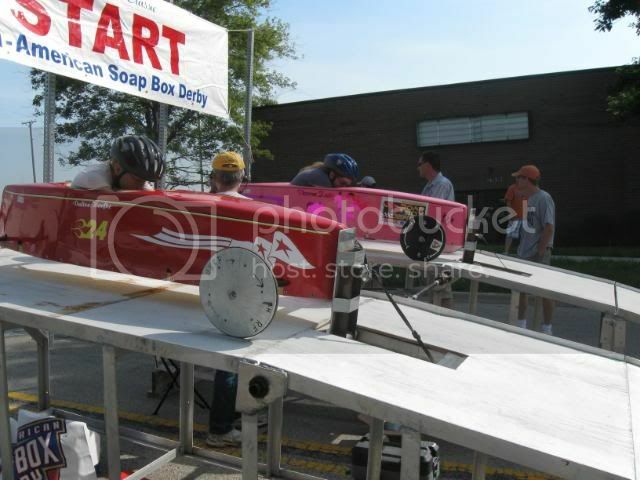 In OH, seek out SoapBox Derby experts...they are everywhere, and the two race formats have alot in common. There is plans the the cub scout guide book, for den leaders or for the committee. Also look for pictures and info deeper in this foru section. 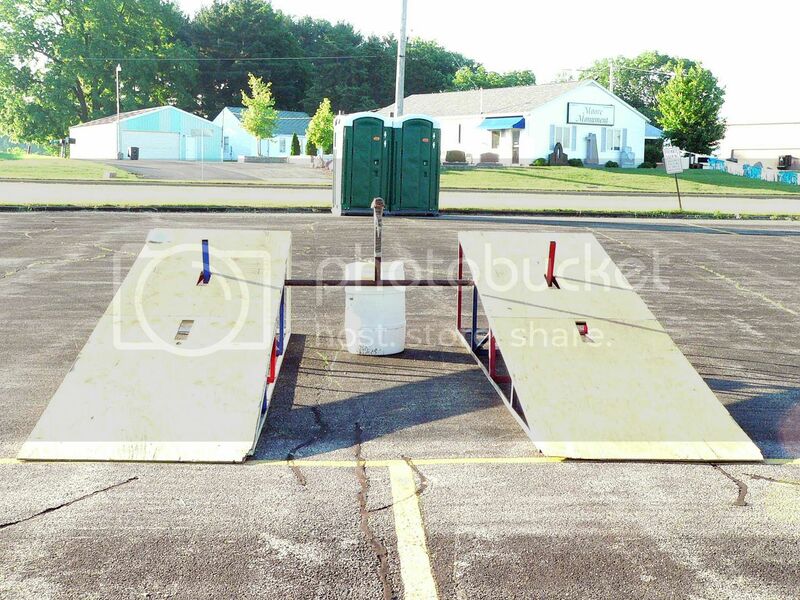 I have posted specs and info and pictures of a few ramps. 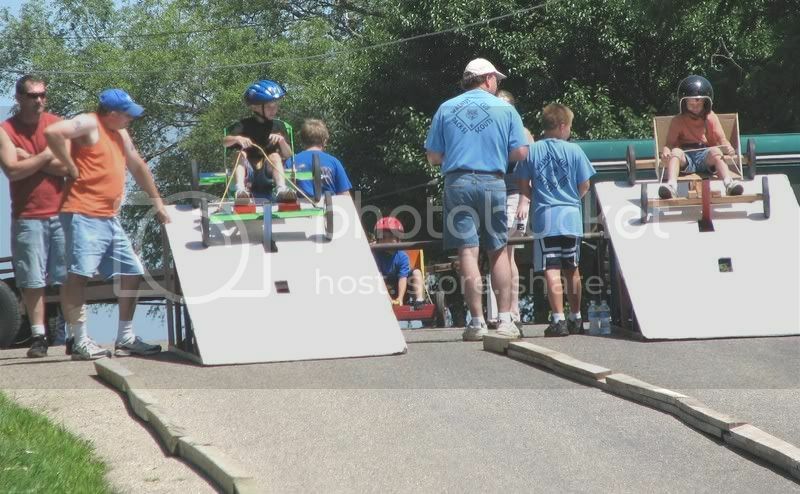 Any pictures, usually any of the racers my kids did, those pictures have pictures of the ramps also. Many ramps that I know about are 3 1/2 high in the back and made up with wood or angle brackets / bracing. 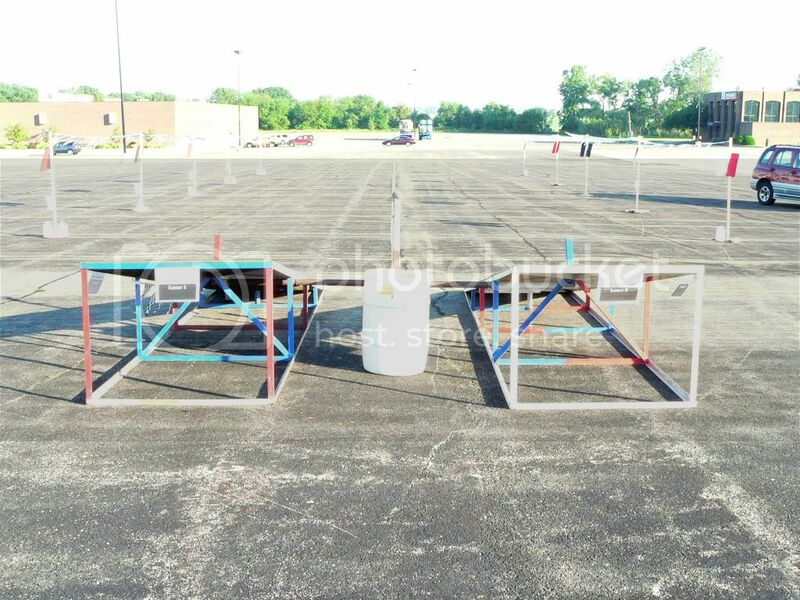 2 sheets of 4x8 sheets 1/2 thick are used with bracing underneath. for one lane, need two lanes. depending on the rules, the start gate is often a lever manual action, connecting both ramps to open or close at the same time. no spring action, but have seen them. 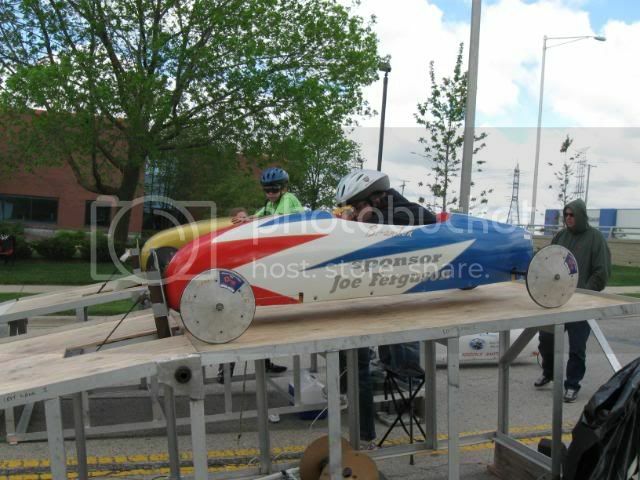 the ones i used and helped with were made up of round tubing and square tubbing mounted under the wood with wholes coming up in the center of each lane to hold the cars and release them. a bit of a trick to get them both the same and equal distance so they do not get one car a advantage over the other. whiles raised sides are recommend. the biggest issue is people having to either roll the cars up or lift them up and load them from the back. the other issue, is speed. 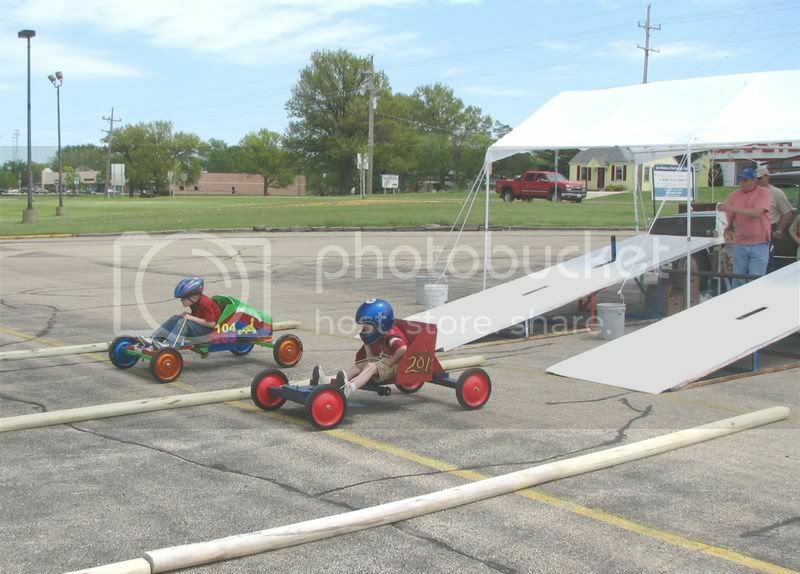 cubmobile are not designed to handle speeds over 12 to 14 miles per hour and if modified to do so, keep the kids abaility in mind. rope steering leaves allot of issues to come about. and many cubmobiles are poorly built. The 2nd set of wholes you see, is they thought it would be to fast, but it was to slow, so they add the set of wholes that you see them using. 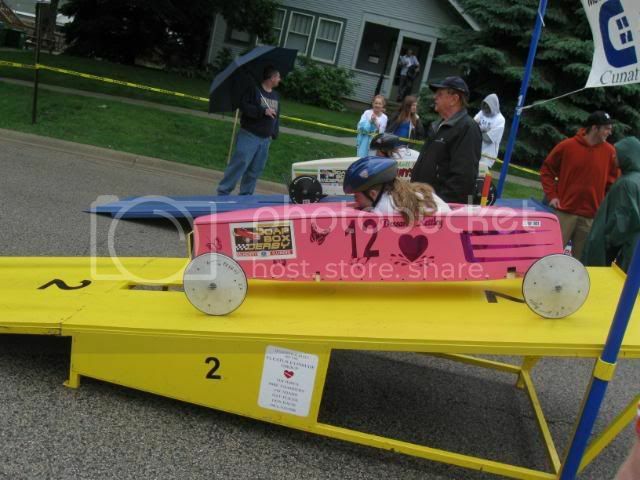 Those are also my kids in most of soap box derby cars. 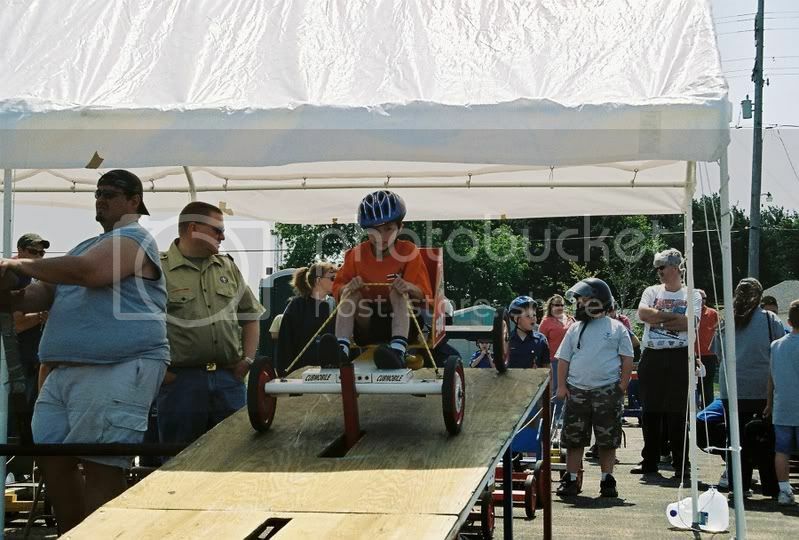 standard cubmobile rules, 52 inches long center frame, or 48 inches from axle to axle. 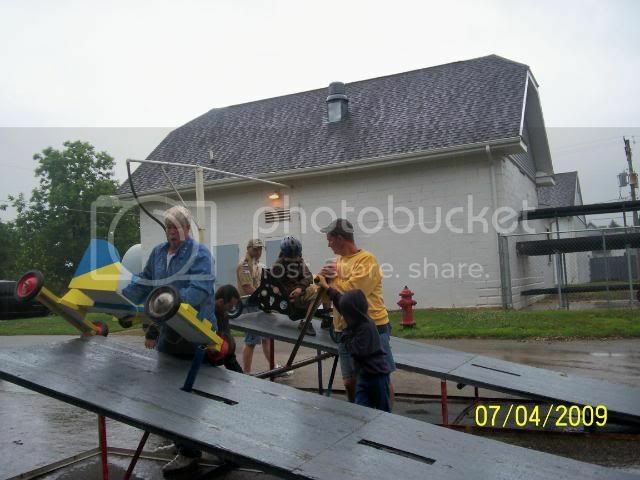 but the car is a tad longer and as seen on the cubmobile ramp. it just fits on there. so if they built one wrong, it will not fit. only 1 inch to spare. as you look through the pictures, the guy holds the level up, this keep the cars staged, he just dropps the lever and the cars go. have not seen any dragging issues on the gate. A fancy solenoid system would be neat, but gonna be a beast of one or hydrolic, but I seen one with a spring and rope type release. But its a tad tedious throughout the day, but doable also.